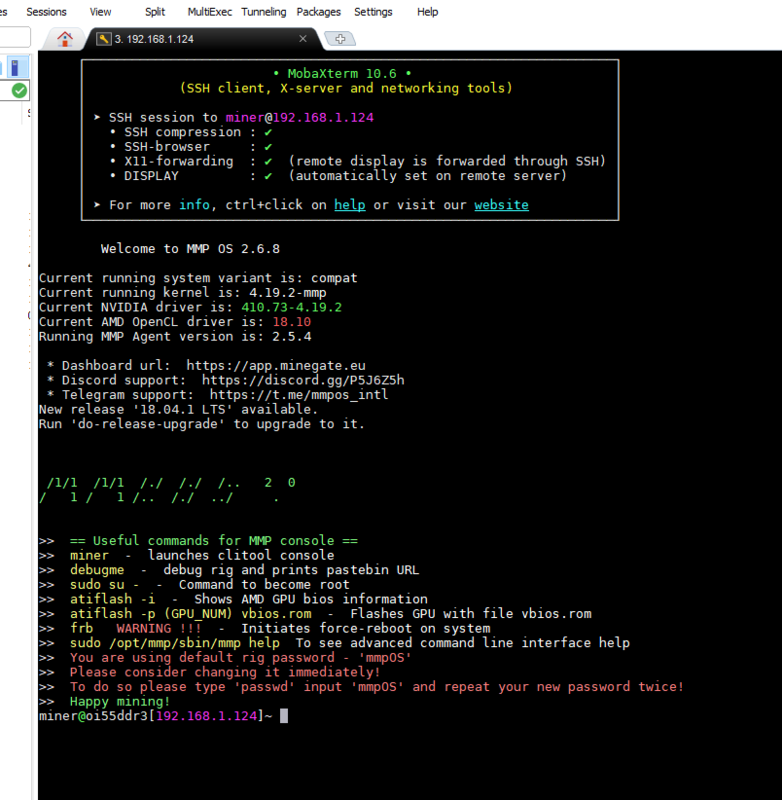 SSH to your mmpOS rig with this guide. 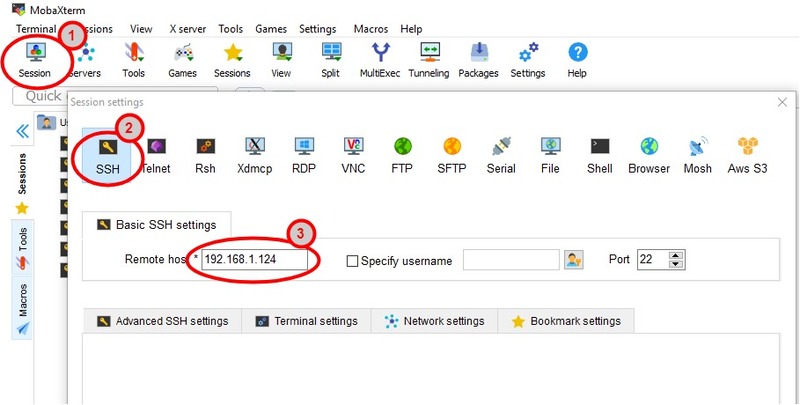 1 – An SSH tool, we prefer MobaXterm, because copying files between your Windows machine and mmpOS rig is simple. Or puTTy or similar. 3 – Be on the same internal network as your rig. If you want to remotely SSH to your rig, you will have to enable port forwarding – which opens your rig to all kinds of people with malicious intent. Port forwarding is not recommended. 5 – see your IP address – write it down or remember it. 1 – The default username is “miner”, and the default password is “mmpOS”. 2 – Your password won’t show as you type it into the console – just type it carefully and correct and press enter. 3 – It is highly recommended that you change the password by typing passwd, type the current password (mmpOS) and input your new password twice. When you are logged on successfully, your screen should look like the one below. Take into account that these guys are continuously improving and upgrading their product, so the options might change somewhat. You can now perform some of the commands that showed up in the “useful commands” listing, or perform the command line tasks that you were instructed to do by the support guys. Disclaimer! You do this at your own risk. By typing this guide we do not take any responsibility for your actions, or bricked cards. Once you’ve started your rig, and you’ve got some AMD RX cards running, you probably want to start overclocking to get the most hashing power out of your cards. You can try to find a modded bios on the web, there are free ones and some at a cost. Downloading a BIOS from the web is risky though – please make sure that you are 100% convinced it is the correct BIOS. Personally, we won’t do that, unless we know the person who did the mod. Either way, you will first have to find out what BIOS you need. For a small donation for our time, we can do the “one click” BIOS mod for you, if you’re a little uneasy. Read the disclaimer, Contact us here. We can also have a custom BIOS mod made for you, which will give you the highest hash rate your card can achieve, as well as cut your energy consumption by about 30%. This comes at a cost to be discussed, and NOT included in the below tutorial. An SSH tool, I prefer MobaXterm, because copying files between your Windows machine and SMOS rig is simple. Or puTTy or similar. Some cards have a hard bios switch – visually inspect your card carefully to see of there is one. It will be marked. 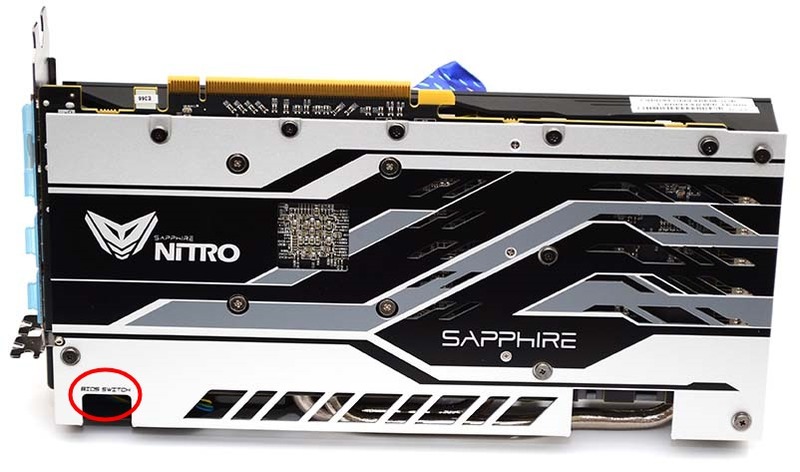 Sapphire RX580s is situated on the hdmi plug side, on the top. The overclock mode is closest to the HDMI plug, silent mode is away from the HDMI plug. 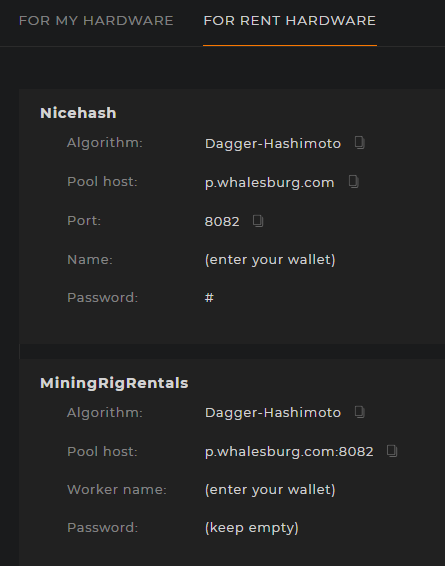 You will see the difference in hashrate as you run your rig. Only flick the switch when your rig is powered down. 1 – Set all cards the to the same hard BIOS switch position. 1 – Did you read the disclaimer at the top? Go read it again. 2 – SSH into your rig. If you don’t know how, use our how to SSH into your rig guide. 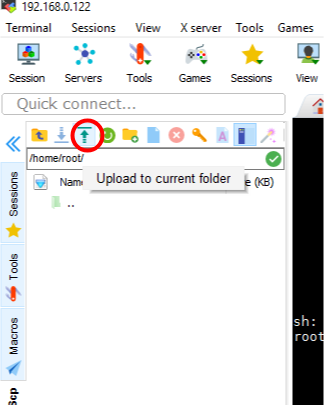 We use MobaXterm here, because it is very easy to use, and you can easily download and upload to and from your windows machine and your SMOS rig. *if your rig crashes or freezes during these actions type “killall screen” to stop your miner from mining before you try again. 1 – Type (or copy) “wget http://54.67.59.249/amdmeminfo.tar.gz && tar xvfz amdmeminfo.tar.gz && sudo mv amdmeminfo /usr/local/bin” to download amdmeminfo. 2 – Type “sudo amdmeminfo” to see your cards and their details. These details, like memory type is quite important here if you want to look for a pre-modded bios (against our advice…. lol). Before you start modding your bios, you have to back up. Because good practice. 1 – So, type “sudo /root/utils/atiflash -s 0 gpu0.rom“. 2 – Do the same for GPU1 and however many you have. For example, type “sudo /root/utils/atiflash -s 1 gpu1.rom“. 3 – Type “ls -l” to verify that all your bioses are saved and backed up. 4 – Verify that your backed up bioses have a file size – 0 is not good. If this happened to you, type “killall screen” and try again. 5 – Now, transfer these backups to your Windows machine by using the “download selected files” option on the left hand side of your screen. 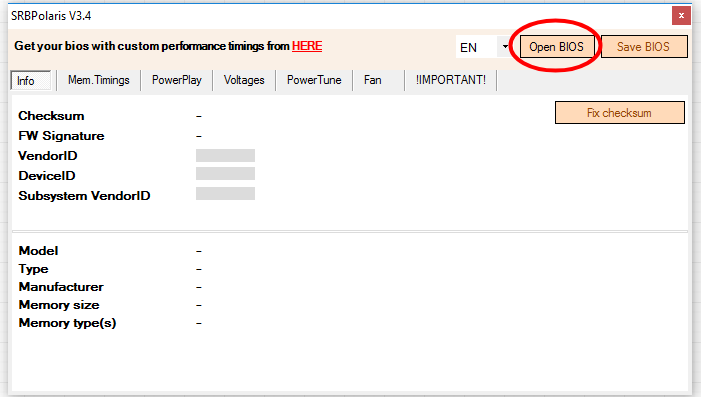 1 – On your Windows box, open GPU0.rom with SRBPolaris editor. 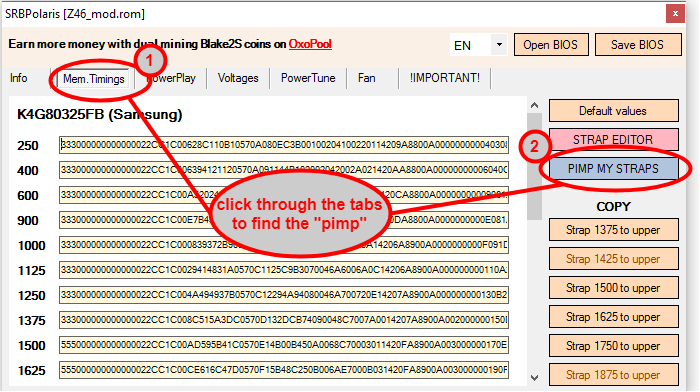 2 – Depending on the program you are using, find the “pimp my bios” or “pimp my straps” button and click it. That’s all you do. You don’t have to click twice, or do anything else. Just accept the messages that pop up. 3 – Save the bios file with a new name, like GPU0mod.rom. 4 – Do the same for however many bioses you have. 6 – Now, flash your bios with your modded bios. You should get a confirmation that it was successful. Stare at your hashrate in amazement, tell us your hash improvements in the comments, and send us coinz, tell your friends. Update 22 November 2018: below to PPLNS method. It’s been almost 10 years since the mining of crypto coins have become possible, and the world has changed a lot since then. Whether you’ve been in the game since 2009, or only for a few months, you know this: it ain’t as easy as it used to be, and profits and gainz have dwindled. 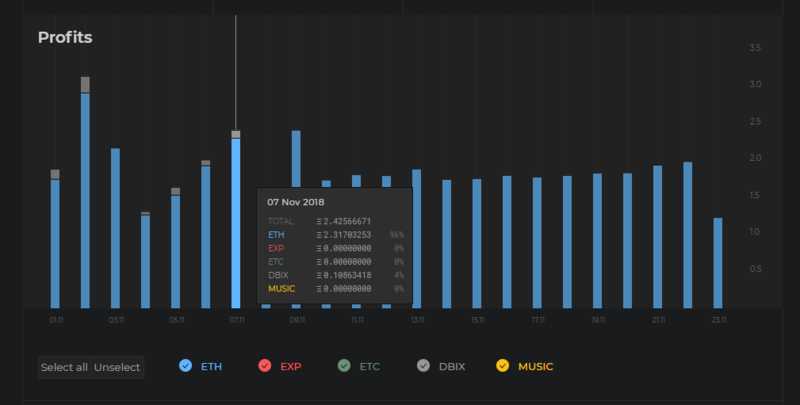 Most of us would like to make the most out of our rigs, and due to coin fluctuations, you probably have spent days switching pools, switching coins, and clicking refresh on whatomine and coinwarz. They are great sites to use to understand and get an overview, but if you have to respond to each coins momentary blip, you will be a very very busy person. Logically, you need some smart and automated system to watch and manage profitability for you. Profit switching pools are currently the smartest solution to this profit hunting problem. The benefit of “mine the algorithm, not the coin” becomes very clear as you do your research on increasing your immediate profits by that extra percent or two. 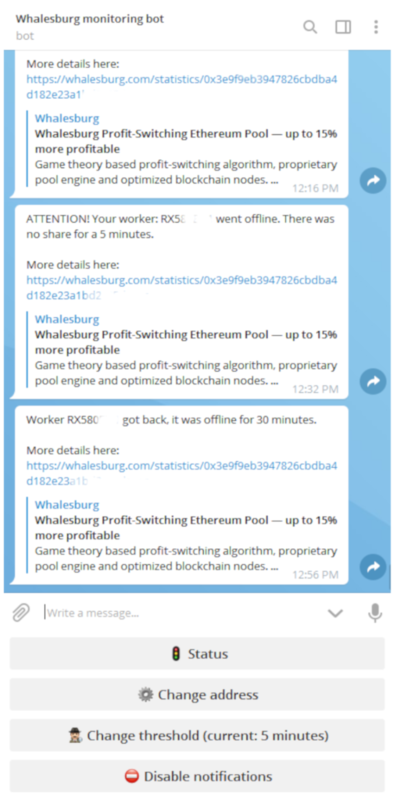 Whalesburg, the most profitable profit switching pool we could find. 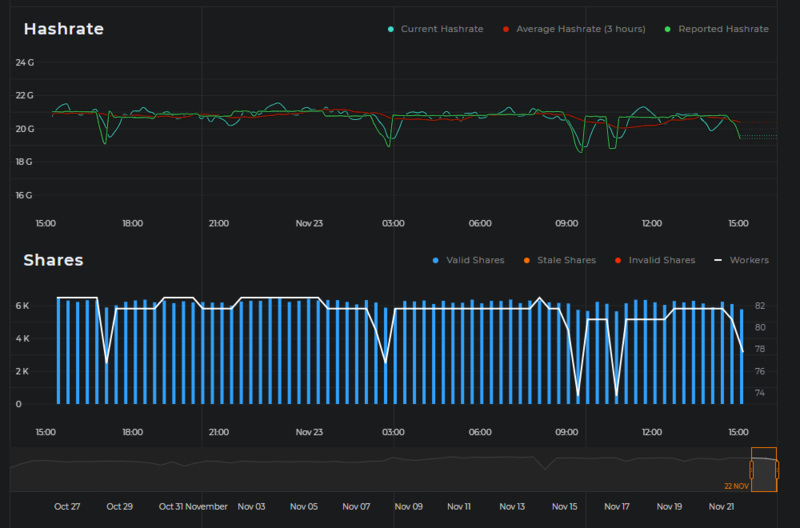 Whalesburg profit switching pool boasts to be up to 15% more profitable*than other pools. 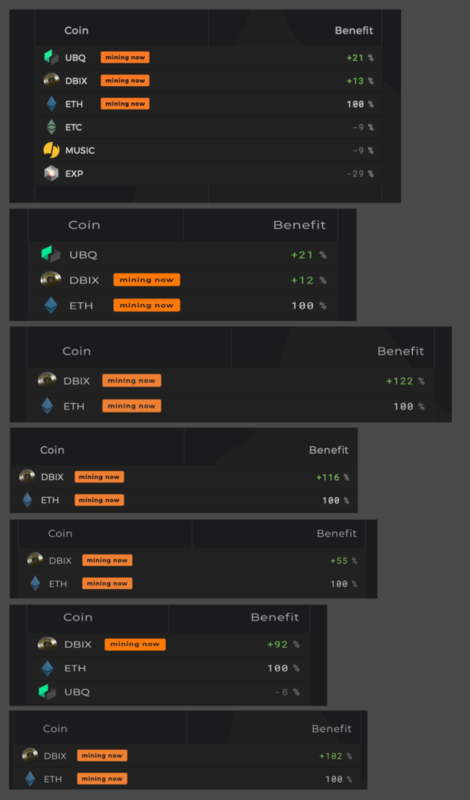 Whalesburg currently mines ethash, with ethereum (ETH), ethereum classic (ETC), ubiq (UBQ) and expanse (EXP). More algorithms and more coins are currently in the pipeline. You can build your own rig, or buy a rig from someone, or buy an ASIC miner. I would suggest something really simple. Look for a mining motherboard with around 6 PCI slots. For some instances riser-less motherboards are better. Go for the simple motherboard and PCIe risers at first, until you get comfortable with your cards temperatures and temperaments. RX580s are cheaper than Nvidia – grab what you can afford and get going. should i choose AMD RX580s or Nvidia? It is a good idea to buy the same cards for one rig, i.e. 6 x RX580 or 4 x 1070ti, for uniformity and ease of management (as a noob). Read up on power supplies, and buy a proper 1600Watt power supply, according to your cards requirements. Search for “mining PSU”, you’ll find many suitables. Most people like to use windows, because they know how it works. Windows has pro’s and con’s. the mountain of extras supplied by Microsoft interfere in your mining and rig stability, like patches and crashes, information gathering, downloading stuff that you didn’t want, etc. (there are quite a few articles and how to’s available to disable these windows functions). 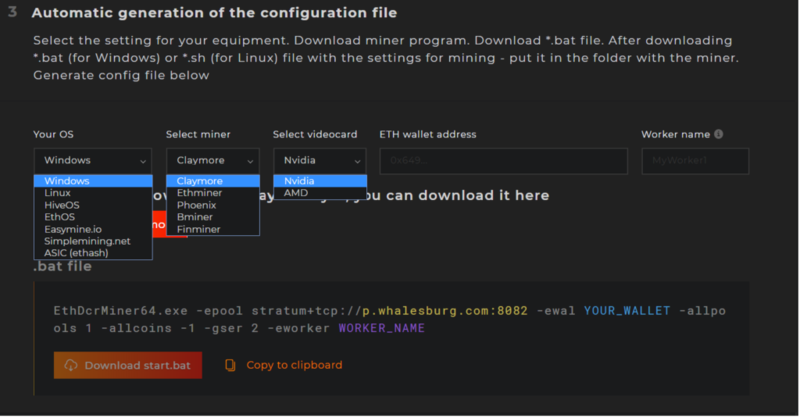 We suggest mmpOS (https://app.minegate.eu), which is a magnificent, mining specific, lightweight, Ubuntu based system, which runs from a USB flash stick. You can find it here – it includes, management, remote access and monitoring, your first 8 GPUs are free, and you pay for the rest. It works out very cheap. We can help you with it, and take you through the basics. You will need a wallet to receive your coins and gainz. You will have to put your wallets receive string into your miner so it knows where to send your payouts. You could have hardware wallets – which are safer than app wallets, but cost money, or you could choose an app wallet, or a web wallet. 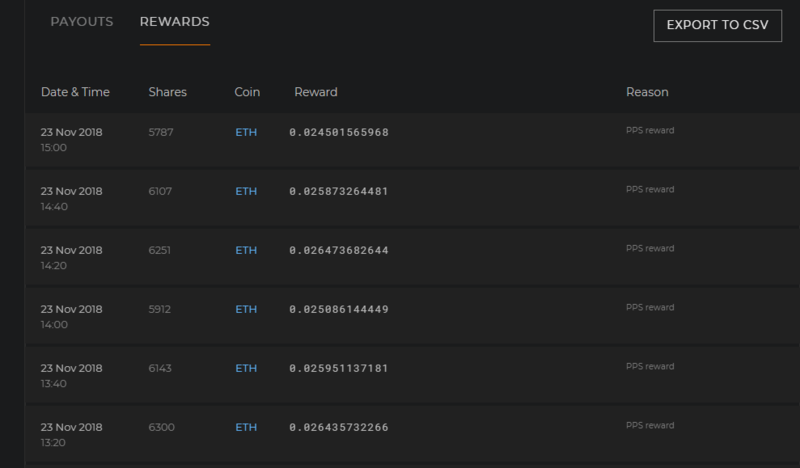 We prefer Jaxx, because it houses and receives quite a few different coins, you can exchange coins in it with shapeshift (i.e. ETH > BTC), and it lives on your device (smartphone). Uber important! Each wallet has a specific encryption key and backup sequence. Please make sure that you keep your keys and recovery instructions and information in a safe place. If you lose this info, and your wallet crashes, you lose it all and nobody can recover it for you, ever again. For each coin that you decide to mine, you will probably need a wallet address (unless you mine on a pool that converts coins for you – in which case you will need a wallet address anyway). A wallet address is the long “receive” string which you will find in your wallet. 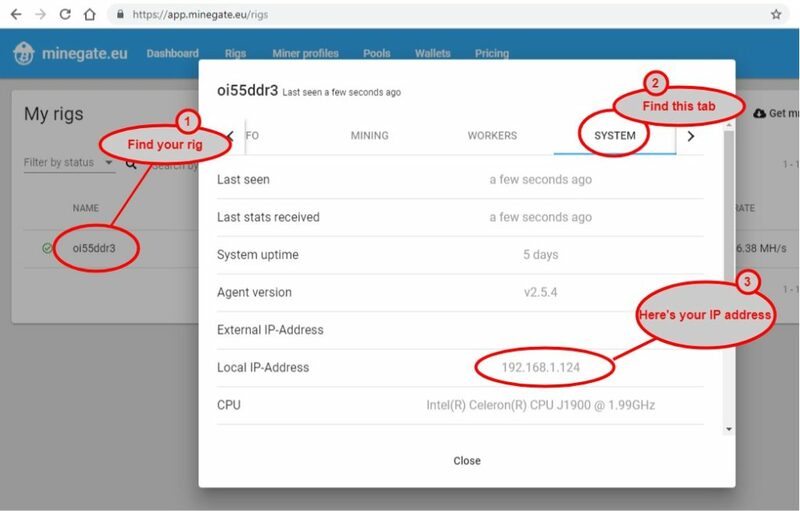 SSH to your simplemining.net (SMOS) rig with this guide.